Nikon is planning to update its ultra compact mega-zoom camera A900 successor. We have already published the registration details of the camera a while ago. And be assured will update you soon as we get any new information related to the camera. The Nikon A900 camera features 20MP 1/2.3″ BSI CMOS Sensor and a massive 35X optical zoom lens. The A900 also records 4K videos at 30FPS and a fully tilting screen. For, wireless file transfer and remote controlled operation we also have Bluetooth (BLE), Wi-Fi, NFC Connectivity. Nikon A900 is a part of Nikon next generation of compact cameras and we don’t expect any big improvements inside the camera. However we still have a large room for possibilities, Japanese website digicame-info expects Nikon may introduce large sensor inside the Nikon A1000 camera. Sony announced the Sony RX100 VI ( B&H Store ) camera. The camera features of bunch of improved specification compared to its predecessor. And one of the most important feature that the Sony RX100 VI camera carry is the 24 to 200 mm f/2.8-4.5 zoom lens. That is your getting approx 8x optical zoom lens with Sony RX100 VI camera. The ISO range of the camera starts from ISO 125 and goes upto ISO 12800. Sony RX100 VI camera features 315 phase detect auto focusing points and 25 contrast detect auto focusing points that covers approx 65% area of the sensor. And one of the most important thing is the camera is able to do continuous Autofocus while having 24fps burst speed. The camera also features a flexible display screen that can be also used to do Vlogging. However the camera do not features any external microphones support you have to use internal microphones while recording videos. The camera features beonz x image processor with front end LSI circuit as we have already seen in the Sony A9 camera. The camera takes only 0.03 seconds to lock autofocus and also features Eye auto focus tracking as we have already seen in the Sony A9. With 5 Axis image stabilization system you are getting zoom lens that covers range starting from 24 mm to 200 mm. The 8X optical zoom lens have Aperture range from F2.8-4.5, so you can get amazing low-light images even at Tele-End. The camera Does 4K video shooting with full pixel readout and no pixel paining. You are so get 4K HD and HDR workflow. The camera also does blazing fast auto focus while you are creating 4K videos. While utilising the 315 phase detect auto focusing points and 25 contrast detect auto focusing points. Click here to Download the Full Specification of the Sony RX100 VI Camera. It’s look like Canon is now busy in preparing Fuji X100F competitor. According to a latest rumors coming from an new source the upcoming Canon G1X Mark III camera may have a APS-C sensor. If we look at the current sensor size of the camera we will find that the APS-C sensor is quietly 20% more bigger than Canon 1.5 inch sensor. But there is nothing to get excited about since the rumor mill says the information is coming from a new source, so take it with a a pinch of salt. But at the same time if you look at the patents, Canon does have a compact camera with a APS-C size sensor as we have published on on July 16th, 2016 and on the same day we got a lot of emails saying So is this a G1X II replacement? PS: As we have mentioned earlier the Canon G1X camera life cycle was 2 year and 1 month and current Canon G1X Mark II camera is 2 years, 8 months old. So announcement of new product is expected soon. 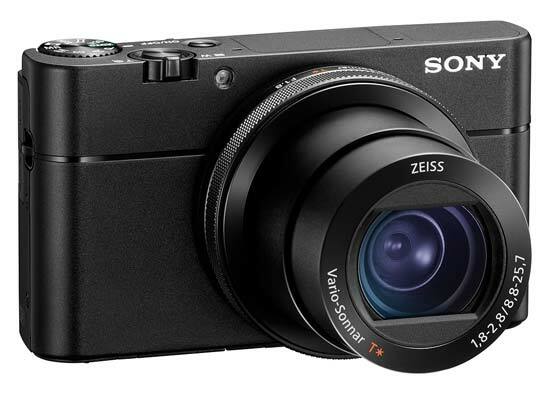 We have told you on May 2016 the Sony RX 100V coming with Hybrid AF sensor. And finally announced the long rumored Sony RX100 V camera today. The camera features 20MP Hybrid CMOS AF sensor with 315 Phase AF points. The AF speed of the camera has now touched a new heights of 0.05 seconds. Sony RX100V camera features bright 24-70mm equiv. F1.8-2.8 lens, offers 24 frames per second continuous shooting speed with AF/AE tracking for up to 150 continuous shots. The camera captures 4K video while utilizing the Hybrid AF points for blazing fast AF performance, S-Log2/S-Gamut and Picture Profiles are also available to videographers, as is 1080/120p. The most important part of the camera it utilizes 5028 x 2828 pixel region to create 4096 x 2160 video, that clearly means the camera is oversamples by 1.3x in each dimension (1.7x overall), to give highly detailed 4K footage. On the rear side of the camera we have 3″ 1229k-dot LCD tillable display unit. The camera is prices at $1000/€1200 and available from October 2016.